The Goddess Gayatri has five heads: four depicting the four Vedas and one depicting the Almighty of the Universe. Her Yantra is a sign of auspiciousness and upon praying regularly, you can be blessed with good health, wealth, prosperity and peace. The golden grace of the Sun comes through this Goddess. Brighten up your inner life with a more cheerful, sunny outlook and truly walk a pathway to enlightenment. Goddess Gayatri has the power to fulfill your spiritual aspirations and bless you with a hassle-free life. She can also illuminate you with healthy new thoughts. 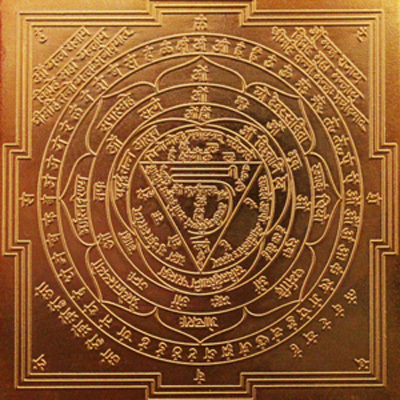 The positive power of the Gayatri Yantra can liberate you from negative spirits and bad dreams. It can help you strike a balance between your spiritual and material desires to live a harmonious life full of happiness, peace and prosperity! • People who desire a problem-free and peaceful life. • People who are influenced by negative forces. • People who want to attain success in their endeavors. • People who wish to shine with cheerful energy.